With more than a decade of experience when it comes to handling garage door repair issues of all types, we have a great understanding of the different issues you might be confronted with during the course of your garage door's life. From openers that just won’t move, to doors that have jumped off the tracks, our technicians have seen it all before and are ready to provide you with a solution. Dents can prove extremely problematic if left alone. Small ones can ruin the look of your door, while larger ones can compromise your door’s security and cause your system to work harder. In either case they'll need to be removed, and our team can help with this. If the dents are too large or severe to be removed, our team can supply and fit replacement panels. As well as repairing your existing door, our team can provide an excellent installation service. If you know what you want, we’ll be able to supply it thanks to our links with top brands such as Clopay, Amarr and Windsor. If not, our team will make sure you get all the guidance you need to pick out the perfect unit for your home. 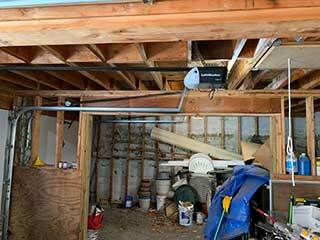 At one point or another, every homeowner will encounter garage door springs that just don’t work anymore. This is inevitable, as these components are put under a lot of strain every day. Our technicians will quickly and safely fit a new set of springs, and will ensure they’re perfectly balanced, guaranteeing optimal performance and safety. If your springs have already broken, we offer emergency replacements to get your door working again as soon as possible. Whether you're in need of an emergency service appointment, or you’re looking to upgrade your door or opener, get in touch with team at Garage Door Repair Hastings today. Our team is always ready to help - find out what we can do for you.